What is this ? Duplicate GPU ? Hey guys, i am really confused about what this "GPU" is in Dell EC (embedded controller)? I don't know what this GPU is for ? I mean i already have ATI GPU temps down there. As you can see my GPU is idling around 51c in GPU [0#] and i am getting same temps reading from other apps/gadgets as well ! I am really curious about what this new "GPU" under Dell EC is doing ? Also my laptop has overheating problem, so when this "GPU" under dell EC goes to 106c my laptop shuts down! It also idle at 86c - 90c most of the time! I don't think its a GPU core ? Because my Real ATI GPU is much cooler as you can see in Screenshot. One more thing.... What is IMC/IGP temperature ? AFAIK my laptop has only one graphics card. That is ATI , No iGP whatssoever , let me know about auxiliary under DELL ec as well ! The "GPU" under DELL EC sensor is a temperature which on most DELL systems stands for GPU temperature, however there's no guarantee that it's on yours too. I'm afraid that I can't give you exact information, but this DELL EC sensor is DELL-specific and only they exactly know which temperature belongs to which component (the same applies to the Aux value). I assume on your machine it might be the mainboard's voltage regulator (or maybe something else). As for the IMC/IGP temperature, this is the value of a temperature sensor in CPU which should be of close proximity to the integrated iGPU or Memory Controller (IMC) in CPU. It's just a generic name representing temperature of a certain sensor in CPU. Thanks for reply! I appreciate it! Your application is perfect! This GPU thing is really bugging me! 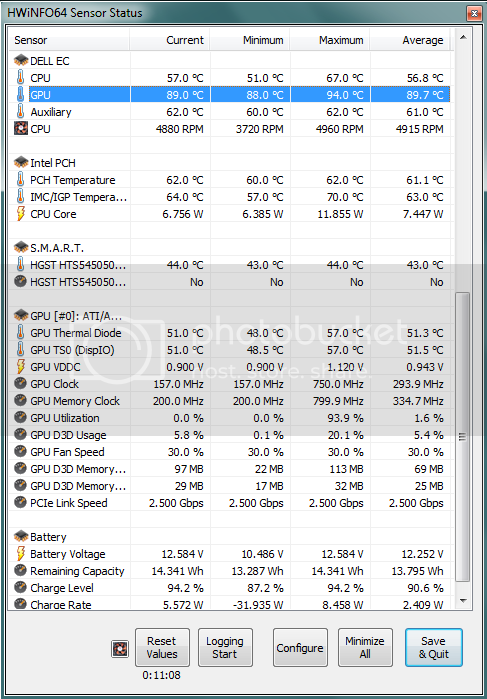 As soon as it reaches 105-106c my CPU shuts down, Gonna google whats going on.